The low quality of the Chinese air is more than simply a nuisance – China has by far the worst air quality out of all the industrialized countries, and it’s estimated that 16 of the world’s 20 most polluted cities are in China. Needless to say this significantly raises mortality and causes a myriad of health issues – but are the people who leave their homes in search for better air truly environmental refugees? Phoenix Island is an artificial archipelago forming an island resort currently under construction in Sanya, Hainan Province, China. So far, we’ve seen that America’s first environmental refugees were forced to flee their Alaskan village, due to rising water levels, but apparently, that term needs to be broadened more and more. More and more wealthy Chinese are leaving heavily polluted urban centers, flocking remote, coastal environments. 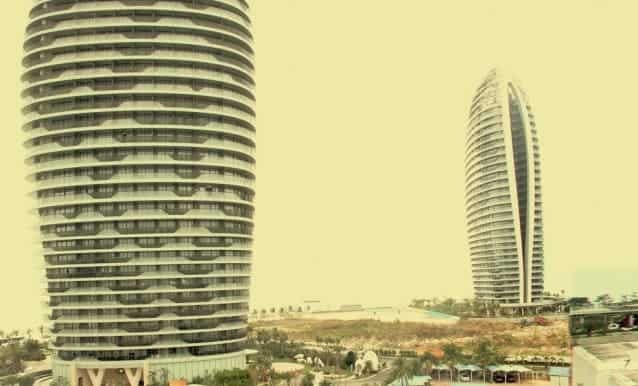 For example, Zoe Zhang, a Shanghai housewife, one example of this trend, wants to move Sanya in Hainan, a tropical island in the South China Sea that reported just one “slightly polluted” day last year compared to 189 days of polluted or heavily polluted air last year in Beijing. Of course, this has extremely high financial costs, and only a fortunate minority can afford this. So can they really be called environmental refugees? According to Wikipedia, the term ‘environmental refugee‘ or ‘environmental migrant’ refers to people who are forced to migrate from or flee their home region due to sudden or long-term changes to their local environment which compromise their well being or secure livelihood. If you take it like this, virtually all the people in Shanghai and Beijing (and many other Chinese cities) fall in that category; but of course, you can’t relocate all the people, and while their health is significantly threatened, they are not ‘forced’ to leave – like the people in the Alaskan village were, for example. Personally, I think we need a new term; as environmental conditions change more and more across the world, and as more and more people have their lifestyles (and even lives) threatened, we need differentiate between different types and magnitudes of threat. We need to differentiate between people who simply can’t continue living in their homes anymore, and people whose long term health is threatened. I assume we’ll be hearing this type of discussion more in the near future.